∆ Professor Hawking's Mad Scientist Paradox - without Time. - A Brief History of Time-lessness - Matt Welcome. Professor Hawking's mad scientist paradox involve the concept of 'wormholes' - in effect the concept of tunnels through space and 'time' apparently connecting one part of space with another part of space - and- in a different time. Causality - is it from A to B or 'over time'? Time travel paradoxes center around the idea that normally, effects in the past change things in the future, and that if 'Time travel' was possible ( by a person or a 'signal') this would surely lead to conflicting, or paradoxical results. The very fact that we see how all these scenarios would lead to 'paradoxes' should be taken as a clear sign, either that time travel is impossible, or that we may be on completely the wrong track with even the idea that 'Time' exists. But typically ignore this second possibility, instead, suggesting possibilities that there may be some universal law preventing time travelers from meddling, or that if a time traveller tried to create a paradox an entire new parallel universe might be created. In which the paradoxical event happens, but its consequences occur in a completely different universe, creating another, parallel future. To me these 'solutions' sound like an ever escalating chain of 'fixes' covering up the possibility that we may have made a very basic error at the start of our analysis about what does, and does not exist in the universe. While the idea of time seems to lead to paradoxes and fixes, the idea that the world is just as we see it, filled with things that just exist and interact, here, now, seems to dispel all misunderstandings and suggested 'paradoxes', as follows. Analyzing, and re framing a classic 'time travel paradox' reveals how 'causes' just affect the things physically 'in front of them', and are not also things from the past, affecting things in the future 'now' (however that is meant to work). Picture from Youtube video - Hawking's mad scientist looks through a 'time portal' and shoots himself 'before' he has finished assembling the gun he uses. Unless we have some real proof that at least 'the Past' exists, then perhaps we shouldn't jump to the conclusion that 'Time exists'. If time does not exist, then perhaps the mad scientist doesn't see himself 'in the past' - but just sees 'distant' images of himself that have been looped around a 'massive' (space bending) object and brought back to him. This 'looping' of images is theoretically perfectly feasible because around very dense objects, such as neutron stars or black holes, is an area known as the 'Photon sphere'. This is the location at which light itself will orbit the object. Although light in this location is probably in a very unstable orbit all that matters here is the essence of the theoretical possibility being explored. 1 Causality - is it from A to B or 'over time'? 3 Stephen Hawkins ‘Suicidal Mad scientist’ explained without time. 4 The simpler mad scientist. 5 re - 'the wormhole itself is the problem'. 6 Reach out and touch me. Stephen Hawkins ‘Suicidal Mad scientist’ explained without time. Professor Hawking's mad scientist paradox involves the notion of travelling through time, and does so brilliantly by compressing the famous but long winded 'Grandfather paradox' down to a single scene. It is sadly however just this type of thought experiment that I think is completely unfounded, not because I'm a Luddite, or trying to ruin everyone's fun, but because logically it seems to me we have no real reason to even assume 'the past' ever exists in any form at all - other than as a useful term of phrase. Many people insist that time obviously exists, becasue 'Time' is the word, or kind of 'collective noun' we use to conveniently sum up all the existence and motion we see around us. Stuff clearly exists and moves... which is what we said 'Time' means' - so of course time exists. This is fine, but then once familiarity has arisen around the word it seems to take on extra meanings - and we start to wonder "can we travel through time?''. This sounds pretty innocent until you reword it 'can we travel through the 'word' we made to sum up motion'. Which is rather confusing. Another way to see this error in logic is to consider that if we say 'Time exists' because 'Time' is the word we use to describe the fact that matter 'exists and moves' - then, when we say 'matter exists and moves... over time' - we are really saying 'Matter exists and moves... matter exists and moves'. So adding the words 'over time' seems to be saying something extra, but really isn't actually saying anything extra at all. In this way we add to the subject a completely redundant, misleading and confusing grey area. Does 'time exist'? - yes - but it's just matter and motion! This is like me saying that 'I, and bill, and a number of people went to a party'. Here I seem to be suggesting that more people than bill and I went to the party. But if it turns out that by 'a number of people' I just meant 'bill' again, then the sentence is true, but unnecesarilly misleading and confusing. I.e i am really saying 'Me and bill, and just me and bill, went to a party'. So the word 'Time' has to be considered in 2 ways. Either it is just another word to express the idea that everything is just here now, existing and moving. Or it is a word that referes to something else, and extra, and far deeper - i.e. the existence of 'the future' and 'the past', and a flow of time between them - in which cas things dont just exist and move, but we may beable to go back into 'the past' or change it in some way. If we think time really is some extra thing, or 'dimension' to the universe then in thought experiments we may end up considering professor Hawking's mad scientist paradox as a real possibility. But I think things can be seen in a simpler way which still explains all observations and complies with our confirmed scientific facts. Professor Hawking’s Mad scientist scenario is described on his web site as follows. “I don't like the way scientists in movies are often described as mad, but in this case, it's true. This chap is determined to create a paradox, even if it costs him his life. Imagine, somehow, he's built a wormhole, a time tunnel that stretches just one minute into the past. This kind of time machine would violate a fundamental rule that governs the entire universe - that causes happen before effects, and never the other way around. I believe things can't make themselves impossible. If they could then there'd be nothing to stop the whole universe from descending into chaos. So I think something will always happen that prevents the paradox. Somehow there must be a reason why our scientist will never find himself in a situation where he could shoot himself. And in this case, I'm sorry to say, the wormhole itself is the problem." I think there is a problem here, but it arises because we assume that time exists, then assume space and time are merged ( as opposed to just space and 'motion' ), and then assume we can distort 'space-time'. Being clear about 'Black holes'. Any cosmologist knows that a 'black hole' isn't a hole, but to laypeople this may not be so obvious, 'if its not a hole then why did thy call it one?'. The reason is, that a black hole is 'just' an incredibly dense object, so dense that its escape velocity exceeds the speed of light. Thus if one were in the sky above us - night or day - it would look like a black hole in the sky. Ie it is not really a hole - it may just look like one. Einstein preferred the term dark star or frozen star, but the misleading name 'black hole' is more exciting and suggestive and has stuck. The most striking feature of this object is the existence of a surface, called the horizon, which completely encloses the collapsed matter. The horizon is an ideal one-way membrane: that is, particles and light can go inward through the surface, but none can go outward. As a result, the object is dark, that is, black, and hides from view a finite region of space (a hole). See also Gravitational collapse; Relativity. There is of course a big difference between 'hiding something from view' and an actual hole that goes from one place to another. But things are quite that straight forwards. A the centre of a black hole gravity compresses the matter into a 'singularity', a point where mathematically at least, gravity is infinitely strong and matter is crushed to an infinite density. If however the black hole is rotating, which they do, then this singularity may be spun out into a circle or ring. The problem here is that in relativity, 'space and time' are said to be different aspects of the one thing space-time, And in the 'singularity' space and time are said not to exist. So at the centre of a black hole, we may have a circular singularity, where space and time are said not to exist. And to a cosmologist, this starts to sound like a real tunnel or hole that one could travel through, and travel through to another space and or time. -What i am suggesting, as discussed elsewhere, is that while 'relativity' is written in terms of 'time' existing, and while everything it reveals about the way matter and space affect each other is correct, all these interacts and changes in rates just happen 'now'. And so it is not space and 'time' that are in intimately related, but just 'space and matter', or 'space and motion'. If this is the case, then whatever a circular singularity in the centre of a black hole is, it could not possibly be a portal to another 'time', and there is no reason to think it may even link to another place. "There is no observational evidence for wormholes, but on a theoretical level there are valid solutions to the equations of the theory of general relativity which contain wormholes". As far as I can tell, Relativity, is written using the vocabulary of time (words such as past present future etc), and with the underlying assumption that time exists. But at no point does it prove the existence of time. Otherwise, anything extracted from the equations of relativity probably only tells us about how space can be stretched and warped, and how objects and signals may move through that warped space. Diagram - Here the further from the actual object/event an 'image' is, the 'older' it looks. (its not actually older, its just a pattern of existing and moving photons 'now'). -If we were to claim that the images are 'older' - then we would have to consider that while the images moved away from the scene and got 'older' - the firework and the bottle it was launched from also got older. Therefore, even if the images are said to be older, they and the rocket etc have all 'aged' and are all the same age. Being clear about just how we come up with the idea of a worm 'hole'. Firstly we see that 'mass' warps space (or 'space-time' if we assume 'time' exists). Then this concept is expanded with the idea that the 'dip' as it is shown in this picture becomes more and more extreme the greater and more tightly packed the mass creating it. And so diagrams like the one above make us more open to the idea that perhaps some type of link, or path, tunnel, tube or hole to some other place - or even some other place and time - may exist. So, thirdly, some might think two such areas of warped space (or one extended example) might meet and form some kind of 'wormhole through space time'. However, I'm suggesting there is no time, just space,mass and gravitational fields - which effectively warp that space - and 'warp the dimensions of objects in that space' and 'warp the rates at which things may be changing (now) within that space. I'm also saying that while diagrams like those above are very useful they can also be misleading if we forget that they are just attempts to visualise a 3 dimensional distortion of space on a flat sheet of paper. So while it is often suggested that this deformation (above - left), could be exaggerated to actually become a 'hole' or 'tunnel' (above right), this is very misleading - and as far as I can tell basically just plane wrong. The diagram on the right only really shows that if you have a more massive object the strength of the gravity around and within the object gets greater and greater. Are very useful, but in resembling a mass on a stretchable sheet, they can lead us to forget that whatever is being warped by gravity, the effect is focused physically within the object itself. 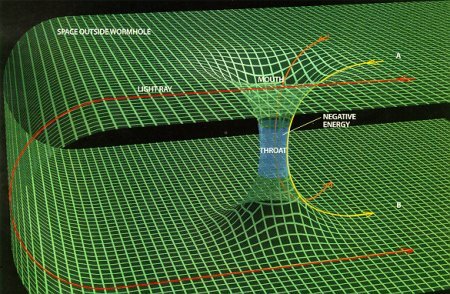 In this diagram it is a little clearer that while larger mass`s distort space more and more (i.e.causing gravity), there is no reason to think 'space' should tear at some point, so a hole or tunnel would form. And, while the suggestion is that mass warps space-time, given that we never see any evidence that anything other than 'now' exists, I am suggesting that mass just warps or dilates what is happening some where 'now'. If time does not exist - then no matter how exotic a frozen star - or 'black hole' may be - no matter how much it warps space , and changes the rate at which things happen in that space - Surely, logically it is just an object that exists in a place - something we could orbit, and examine from any location - or 'put in a box' so to speak. Left - We are in fact just trying to show that gravity - the warping of space - is very strong near a dense object and tails off with distance. As shown by the dark shell becoming lighter with distance from the solid core. In this diagram you can see that while you make the central mass more and more dense , the field of gravity around it will become more extreme accordingly, but there is no reason to assume a tunnel through space, to some where else (or through 'time') could be formed by tunneling into the mass. But the rate of change of any object 'in' the mass would be zero or virtually zero. Center - But we use this image to get the concept of warped space across. Right - This is useful, but but if taken too literaly - and exaggerated we get the idea that a 'gravity well' or kind of tunnel may exist in some way. - and then, because we like the idea of time travel - and - because we assume time exists and space-time can be merged.. So, by the end of this chain of (I believe) faulty 'reasoning' it looks like it makes sense to say we could see some kind of a tunnel through space and time - to another place and/or time. *A black hole gets it name from the original description that if you looked in the direction of one - 'then it would appear as if there were a black hole in the stars'. The visualisation above of how a 'black hole' might 'appear' or if we got close and looked in the direction of one is very useful if it is properly understood. While this picture seems to show a hole in space, it is really trying to show that there is a very dense object blocking our view of the stars behind it, and warping the light from all the surrounding stars. Assuming that a 'black hole' has anything to do with 'real holes' in space just because such an object might 'look' like a hole, make as much sense as thinking that the 'wile E coyote's' picture of a tunnel on a cliff face 'is' a tunnel because it 'looks' like one. A very dense object will have an incredibly strong gravitational field, and this will compress matter into extraordinary states. But just because the gravity and space inside such an object may be warped to extreme limits, .e.g. 'A Singularity', unless we have also proven the existence of time, there is no reason to think that at the centre of this dense object a tunnel or worm hole to another similar object elsewhere, or to another time, may exist..
(In the sense that the objects we call black holes are probably the most solid and dense objects in the universe, logically they are as far away, or opposite to a 'hole' as we can actually get - but it still makes sense to ask what would happen if we could travel through or send signals through such an object ). If we look at how this all started, a 'black hole' - what ever you want to call it - is just a very dense collection of matter. So dense in fact, that at it centre gravity may be so strong that mater is squashed into a form we can't understand, and the rate at which things change there may be dilated (slowed) to virtually or even completely 'zero'. And also so dense, that at the objects surface the 'escape velocity' is greater than the speed of light. This makes for a truly fascinating and unique kind of object, but still an object that you could 'put in a box' so to speak, or walk around and look at for any and all sides. A Simpler 'wormhole' - thought experiment. Diagram - A less glamorous way of trying to enter or pass through a highly 'massive' object - often misleading called a 'black hole'. We could never construct such a tunnel, but it is useful to consider its effect. Though it may not be as glamorous, perhaps if we are thinking about creating a 'throat' through a super dense object perhaps we should start by considering - as a thought experiment - the simplest possibility, and what might happen if we could literally, physically, create a tunnel through such an object. In the case above we can imagine either that the poor astronaut oscillates back and forth through the 'tunnel' or pipe, or falls to the centre of the section and is held there in an immensely strong gravitational field. Assuming she or he is at rest in the centre of the object, general relativity would suggest 'time' would be almost or completely stopped. But there wouldn't seem to be a reason to think some jump to another place or time would occur. It is the term 'space-Time', and the mathematical concept of a 'singularity' at the centre of a (misleadingly named) black hole, that leads us to wonder if we could travel through the 'hole' to another space and/ or time. In timeless terms we would just assume that general relativity would suggest all 'motion' ceased, or ceased as the astronaut was crushed or pulled to and smeared over the inside of the 'tunnel' walls. Our mad scientist needs only warp space and motion (not time) to get a similar - though not identical effect. In the case above, as he is wondering how it will look to see himself getting shot by a bullet travelling into the 'past' - he will actually get shot in the shoulder by the bullet going round in a simple loop - 'now'. We can do this using known physics, as in the diagram above. First the mad scientist sets up near a suitable space warping mass. At his feet lies a gun. (it is already assembled, because I’m not a very good artist). Just standing there, light reflects of the scene, and ‘images’ of the scientist and gun are created and flee the scene at the speed of light. These images circulate the super dense mass, appearing ‘straight ahead’ of the scientist – we can put a window in front of the scientist and call it a portal if we wish. Now the scientist can stoop down , pick up the gun, and aim it at his own image – while the image he sees seems to be 'of the past' because it is a 'distant' one of himself standing over the gun - that has been dragged back so he can look at it. See>> 'Aspects' are not Dimensions. So we are not so concerned here that the super dense object is a 'black hole'. We are not sending signals of matter into or through it, just using it to 'boomerang' space around back on itself so that 'images' etc that we would expect to be a long way away, and heading away from us, end up close to us, and heading back towards us... or rather our mad scientist. Note - the 'thought experiment' image above is just a very heavy distortion of the actual warping of space observed experimentally during an eclipse of the sun on the island of Principe 1919 (subsequent observations concerning black holes have shown space can be warped or folded right back on itself). We can also note that while a massive object may bend space, and dilate the speed at which things move and change in that space, this can still be seen to make sense and work, not 'over time', but 'now. Click image for explanation. Looking at his own image of his gun less self the scientist aims and fires. This means the bullet goes around the dense mass in the opposite direction to the images, and then hits the scientist on his left side in the case illustrated. The only bizarre factors needed here are the understanding that warped space is both warped but seems straight (to anything within it), and an understanding that the strong gravitational field will also ‘slow down change’ for anything within it. There is no need for time to exist, or be dilated for the above to make sense. So all that happens it the scientist sees ‘out of sync’ images of himself, and shoots at them. Whether the images are there or not makes no difference to the bullet that whizzes through them in the opposite direction (the bullet doesn’t ‘experience going back in time’ just because it is going through images in a back to front way). Then the bullet hits the scientist , ‘a while’ after it leaves the gun- to use time based terms. What is odd to consider is that the bullet first ‘hits’ the image of the scientist standing over the gun. Then the image of him stooping to reach it, then the image of him aiming , then the image of him firing, then… the image of whatever he did next – say dropping the gun… and lastly , not the ‘image’ of whatever he is doing – but his body itself. Professor Hawking specifies a 'time delay' of 'just one minute into the past' - I don't think time, or minutes really exist, but I know what he means, so to comply we can make the circular journey of the images the equivalent of 60 * 300,000 km long - or such that images of the professors 'minute' hand on his watch would be out by 1/60 th of a revolution). So there’s no mystery here, and no time travel etc. Just an odd path of images, and a bullet. "Hawking's mad scientist looks through a 'time portal' and shoots himself 'before' he has finished assembling the gun he uses. " Hawking's mad scientist, looks through curved space, and shoots into images of himself assembling the gun he is using. The bullet curves round the space in the opposite direction to the images... and hits him. Does 'Causality' happen 'over time', or just 'in front' of things? Ultimately the scientist could save himself a few trillion Euros and a trip to a black hole, if he just copied Mythbusters TV show and constructed a near circular tube of pipe and fired the gun into it. The effect, a bullet going round in a circle and hitting the shooter is just the same as the less glamorous example above. But in both cases, things just exist, and move. Everything is only ever in one place at once ( though near a dense mass things may be heavily distorted ), and no pat or future is ever seen. If you make this 'Mythbusters' circle very large, the you could fire a gun into it, and thrown the gun away… managing, as the bullet reaches you, to shoot yourself, when you weren't even holding a gun. Odd, but nothing that suggests time exists, or that ‘temporal’ paradoxes have to be dodged. "This kind of time machine would violate a fundamental rule that governs the entire universe - that causes happen before effects"
But when we say 'Causes happen before effects' we automatically take this to mean causes happen before effects in a Time sense. "moving things (causes) affect things (create effects) physically 'in front' of them". In other words, by saying 'causes happen before effects' we literally mean 'before' as in 'behind', thus causes happen behind the things they affect. Even reading this, if one sees the point, the temptation is to think 'yes causes happen 'behind' effects, but also 'before them in time'. But this can be seen as a habitual insistence to hold on to what ever idea (ie that time exist) that is most strongly held in our minds. The idea causes must happen 'before', in a time sense, arises out of the idea, or blind, habitual, insistence that 'time exists anyway, and its always ticking, forward , in some way'. I think the issue is simply that 'Effects happen physically 'in front of' or 'ahead of' causes, in the picture below do you think that where the cue hits the ball, the cue tip is literally 'a moment in time' 'behind' the ball, that it affects 'in the future ? If the pool cue moves to the right, it will cause an effect in that direction , i.e physically 'ahead' of itself. To say this is also an effect 'ahead in time' may be just an 'assumption'. Especially considering that all we ever see is things having effects physically ahead of themselves 'now'. re - 'the wormhole itself is the problem'. I've never liked the idea of wormholes - they seem to be based on 'black holes' and black hole are not holes - the term comes from the description that if looked at they would 'appear as a black hole in the stars'. One problem with wormholes or 'time portals' is that it seems always to be just assumed that the 'other end' will be in some other time, or some far distant location in space. In Professor Hawking's scenario, however he makes it clear that at least the other end of the worm hole is physically pointed at the lab - this is why I think my diagram above is a legitimate interpretation of the desired effect - even though it just wraps space around a dense object (as opposed to fashioning a worm hole through the stretched throat of a black hole). We might still say this isn't quite what we wanted from our warped space, so lets consider shrinking the dimensions, and making a super dense 'pole' around which to warp space. In this thought experiment (if you will excuse the poor artwork and exaggerated arm length) - we can see how if the overall size of the effect was scaled down - using a super dense and very thin 'pole' - the mad scientist could reach out 'straight' forwards -through curved space, and tap himself on the back. Even here we don't have causality problems. It is likely that as he pushes his hand forwards, through light, carrying images of himself, it will seem odd. His arm may appear to change length as he pushes it forwards (similar to how your arm looks shorter as you push it into clear water- and give you a weird visual feed back that does seem to tie in with your physical experience). The only difference is that the scientist can push out a 'straight' arm (or broomstick for example) and the warped space does the curling for him. But non the less he would then tap himself on the back (or shoulder as shown here), this would not surprise him, or 'happen before he made it happen' because the above is basically the same as you curling your arm around a normal lamppost and tapping yourself on the shoulder! because, as stated, there is no real reason to think time exists. Logical analysis of the observed facts suggests that our memories just prove that things can exist, move, and change. 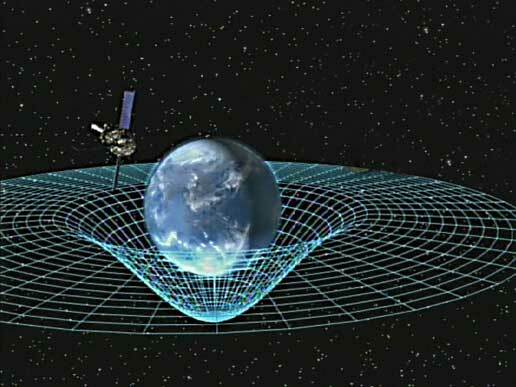 And relativity just shows how the shapes and rates of things can be unexpectedly warped and dilated by speed and mass.